A very primitive form of web design hit the Interwebz in 1989, way before it existed in the capacity we know it today. Black screens with pixelated images were all the rage, until things began evolving, coding became more advanced, and everyone began flocking to the world wide web in mass amounts. Nowadays, if you don’t have a well-designed site, eyes will roll. Which is why web designers are so popular: They are absolutely necessary to compete in the world of online marketing. If web design is what you want to do, then you’ll need to read this. Find a local web design program perfectly suited for you. To put it simply, web designers design websites. However, it’s a bit more complex than that. Web designers need to be both technical and creative in order to come up with a web design that best suits their clients’ needs. They need to understand what makes the website functional, yet provides optimal user experience. Web designers, with their clients’ input, are responsible for the entire look of the website, from color scheme to font to everything else that goes into the overall aesthetics and functionality of that site. With their great web design power comes equally great web design responsibility. These days, many companies have their own web designers, either on staff or on contract. Websites are constantly being updated, and doing just those changes alone can be more than a full time job. You’ll need to have knowledge of some coding, especially HTML. It’s one thing to put the website together; it’s another thing entirely to figure out what’s happening with coding if something goes wrong. You will also need a basic understanding of how graphic design programs like Photoshop work so you can create the imagery contained on the website. It’s a common misconception to believe that a web designer and web developer are the same thing. Well, they aren’t. Web developers, are the architects (architechs?) who work on either the front or back end of the website and create the coding for it. Front end web developers will be handed the website, take what is there, and create a working HTML and CSS script for the information to tell the site how to display itself. Back end designers need to have more advanced coding skills. They focus on how the site interacts within its own web pages, as well as how the user experience works. They may also have to come up with their own coding if they can’t use a “pre-packaged” one that suits their client’s needs. Web designers worth their weight in code must know all the many languages available such as HTML, CSS, and Java. If you can do both web design AND web development, you’re a rare unicorn and completely sought after. Not to mention, you have both the right and left side of your brain all fired up: Web development is generally perfect for left-brain users and design for right-brainers. One thing is certain, without web designers and web developers, there wouldn’t be any websites. So, thank you for making the Internet what it is! Realistically, web designers do not need more than a high school diploma and maybe an associate’s degree. Many web designers are self taught and earn their jobs based on the beauty that is their portfolio. But, if you decide you want to go into web development, that is an entirely different story. Aside from those programming languages, web designers must know how to use graphics, design, color theory, typography, and multimedia applications. If you are a freelance web designer, you also should have some marketing skills and prowess on social media channels to attract potential new customers. It’s a dog eat dog world when it comes to the competition that is web design. You need to be able to stand out above your peers. Understand SEO and how it impacts the website you’re working on. Hint: Load time is a huge factor when it comes to SEO. Keep on learning. Tech changes, and you need to be on top of it at all times. So you need to do a lot of studying and research into what’s going on in all the industries that impact web design. Be available and communicative. Creating websites is a group effort. Whether you’re freelancing with one client at a time or employed at a company, the input of who you work for matters. Responsive design: how the design responds to the device the user is on. Master it. You’re a great presenter. You can clearly communicate to your clients what it is you are trying to sell them. And they’re buying, because you’ve presented so clearly. The more creative you are, the better. You don’t want your clients’ websites to look like everyone else’s. AND, you don’t want all the websites you’ve designed to look the same. Be creative. Don’t be afraid to push envelopes. Do your homework. If you’re working on the website for a dental office, take a look at the competition, see what they are doing, and make yours even better. Know when to give and when to take. In the end, it’s about making your client happy. Web designers can work anywhere. Freelancers can work right from the comfort of their favorite armchairs, local coffee shops, or pretty much any place in the world, as long as they have their computers. Others may work from a collaborative company environment. Generally speaking, tech companies that employ web designers have a tendency to be on the younger, hipper, more creative side, so expect the culture to allow more of a personal freedom. These days, everyone from bloggers to e-commerce businesses to corporations need websites, so whether you’re freelance or part of a team, you’re in high demand. Your best responsive designs. Too often these are left out of portfolios, yet it’s an important feature of web design nowadays. Show your research, because most of the sites you’ve already designed included some sort of it on the way to the end point. Potential clients and employers want to see the full range of how you work. Be able to walk someone through your entire process. It will prove your communication and problem-solving skills are unbeatable. It’s another priority for web designers, because so much of the final project was reached through communication between you and your client. Include a customized theme or template. Show off your crazy coding skills. When you Google yourself, what shows up? Add the really cool things to that portfolio! Supply some testimonials from satisfied clients. Add anything and everything you think makes you look as fabulous as you are. Too much is never enough. Okay, if it’s too big of a file or too heavy for one person to carry, then maybe consider streamlining just a bit. 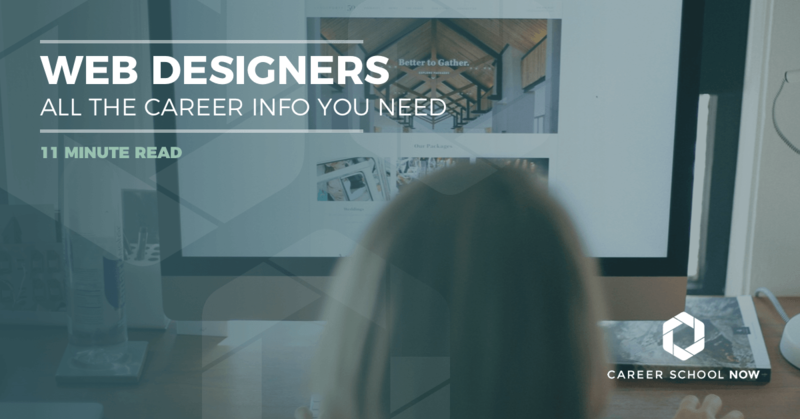 Many web designers start out as freelancers so they can build up their portfolio. Many decide to stay the course and be their own boss. If going freelance is what you think works best for your lifestyle, then there are some things you will need to know aside from having the skills, computer, and proper software. Once you have all the preliminaries set up, you’ll need to start obtaining business. Watch out for the Request For Proposal sites. Many people are just trying to get you to do their work for free, and then they’ll turn around and find someone else to complete your idea. One of the best and most cost-effective tools is an email list. MailChimp, MadMimi, and many others can be installed directly onto your business site, making it that much easier to build your list. Focus on businesses that have a web design budget. You don’t want to give yourself away. NETWORK! Find local networking events and meetups, and go to them. One way to start spreading the word is to do some free work that you can place in your online portfolio. Join professional organizations like Web Professionals, AIGA, International Web Association, and Association of Web Design Professionals. Go to conferences and other design events. Hit those social platforms hard. For any freelancer (or any business these days), not having a social presence is a boatload of missed opportunity. It’s where your people are, so you need to be there. Part of your marketing strategy should include a certain amount of time per day designated specifically to social media. You want more contacts? You can get more contacts if you spend time nurturing and growing online relationships. You never know who you’ll find. You could end up meeting your new business partner or the most generous referral person ever on the planet. Or hey, you could wind up with a new best friend. Success is all in how you look at it. Expose yourself. Your social platforms are perfect for brag-a-thons. You love the new site design you just worked on; show it off to your network. Q&A. If you get stuck, just head over to Facebook or Twitter, ask a question, and you’ll get more answers than you ever dreamed possible. And one of those answers will probably even be the right one! Each platforms serves a perfect purpose suited to your freelance needs. Your Facebook business page can be for sharing industry news, along with showing off your latest and greatest. You can use the Facebook Live feature to allow your fans to watch you work, host chats, or just connect in a more personal way with your following. Creating and using your Twitter account allows you to connect with anyone and everyone all over the world. You can build more business-related relationships, and you can talk to others in the industry. Search hashtags, find relevant ones, and engage in conversation—or just use it to research what others are saying. Instagram is a great place to check out brands, share little snapshots of what you’re doing, and gain attention to yourself by commenting on brands and company pages. Hashtags are huge on Instagram, so be sure you’re using the right ones. YouTube is another platform to consider. You can show off your skills by doing demos and creating how-to tutorials. Don’t forget about LinkedIn, where you can build your authority in the industry through getting involved in the groups. Dribbble is for web designers to share screenshots of their work and get constructive (hopefully) feedback from others in the industry. LoveDsgn is a social network for typographers, designers, and other creatives. Behance is an online portfolio platform for you to show off your work, mingle with others, and see what’s going on in the industry. Colour Lovers is a platform for all things color, trends, palettes, and prettiness. Indeed.com places the average salary of web designers at $61K annually. Junior web designers earn an average of $21.35 per hour. The top end can earn over $110K on average. Factors such as geographic location, the industry you work in, and how much experience you have can make those numbers look very different on your own paycheck. According to Sokanu, the top five states paying their web designers the most are District of Columbia ($80K), Washington ($78K), Maryland ($72K), Virginia ($77K), and Massachusetts ($73K). Bls.gov doesn’t have any stats specific to web designers, but the estimated job growth for web developers through the next few years is 13 percent, which is faster than average. Based on various statistics from around the web, designers are going to see similar numbers, if not higher. This is due to the fact that more and more brands, bloggers, and companies of all types are having websites designed, updated, and improved at faster rates.